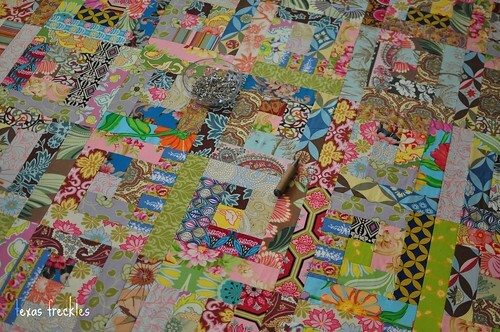 Early this morning, I started pin basting the scrappy log cabin quilt I began early this year. It's a large throw size, about 60 x 70". I don't love it. Honestly, when I look at it now, I don't even like it. I think it needs sashing (a thin light border between each block), but I don't want to have to take it apart. I'll also have to re-work the back if the sashing made it too much bigger. So, do I get out the seam ripper or keep pinning? If I finish it as is, I know we'll use it, and I love all the fabrics, but I'll always wonder what it would have looked like if I had used sashing. It just seems too busy to me as is. Maybe I'll debate further as I attempt to bake this chocolate peanut butter cake for a Christmas party tonight. Does licking chocolate covered mixer beaters bring about clarity and discernment of thought? I love all the fabrics you used. If every time you look at it you will wonder about the sashing, then I guess it's best if you take it apart. It does look like it could use some sashing to help calm it down a bit. Visit Melanie Sullivan's profile on Pinterest. Get your copy at Amazon.com! Sew Mama Sew December Giveaways! 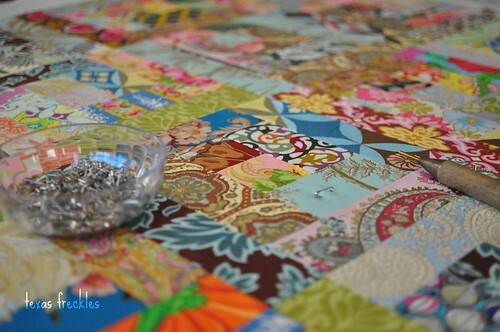 Crazy Quilters: Bad Ideas We Get & Decide Are Brilliant! True Scrap Pocket Pages is TODAY!! Call for help, and prayers!